Serena Williams will play Johanna Konta for the first time when the pair take to the court on Wednesday for the quarter-finals of the Australian Open… BRING. IT. ON. Williams has yet to drop a set through her first four rounds. She faced her most challenging match of the tournament in the fourth round against Barbora Strycova, winning a tight two setter, 7-5 6-4 in one hour and 45 minutes. Williams fought back from a break down three times in the first set, sealing the opener on her eighth set point. The American was more comfortable in the second set aside from a shaky ending. It wasn’t the cleanest of performances from Williams who was serving at just 45% of first serves in and struggled on the forehand side. Still, a win is a win and it was enough for the straight sets win against a tricky opponent. Like Williams, Konta has yet to drop a set in Melbourne. In fact, the Brit hasn’t dropped a set in a nine match winning streak after she won the Apia International in Sydney. Konta won her fourth straight match against Ekaterina Makarova with her most comfortable scoreline of all their ‘Bourne clashes, 6-1 6-4. The second set of that match wasn’t as straightforward as the scoreline would imply as Konta rallied from a 1-4 deficit and dug out of a *0-40 hole when serving for the match. The Brit prevailed though with yet more solid stats, hitting 21 winners to 13 unforced errors.
.@SerenaWilliams advances to @AustralianOpen Quarterfinals! Interesting stat: Through their first four matches, Konta’s stats have been the more impressive; while points on serve won have been pretty close with Konta winning 77% of first serve points (compared to Serena’s 76%) and 53% of second serve points (compared to Serena’s 48%), Konta has maintained a better relationship between her winners and unforced errors with a +25 differential compared to Williams’s tally of -15. Final thoughts: It’s been a while since I have felt this excited about a match-up on the WTA tour and if it’s during the day schedule, I will get up for it no matter what time! Konta has the momentum in her favour following a series of superb displays in Sydney and Melbourne. She has been extremely consistent, serving effectively and maintaining an aggressive streak. Considering this has only been Williams’s second tournament since last year’s US Open, it is a mark of her champion qualities to have navigated the draw she has been dealt without dropping a set. In fact, both players have had brutal draws to get here. Konta’s progression has been all the more impressive because she has had to play four completely different game styles – Flipkens, Osaka, Wozniacki and Makarova are an eclectic quartet! The stats back up that Konta has played the better tennis to reach this stage of the tournament but for Williams, with respect to her last two opponents, hasn’t required her A-game. The American’s ability to raise her level for the calibre of opponent is second-to-none and an in-form Konta rings alarm bells that should awaken Williams. For Konta, there’s a slight concern that she could get slightly overrawed with the situation as she has never played Williams before. On the other hand, I wouldn’t rule out some nerves from Williams who has failed to serve out three of her four matches at the first time of asking. Williams will have to produce a remarkably improved performance from the match against Strycova if she’s going to come out as the winner. Pre-draw I would have taken Serena in this match-up. As the week has unfolded and this encounter has loomed on the horizon, there has been this growing sense of realisation which finally hit me this morning… I think that Jo might win this. January 23, 2017 in Australian Open, Konta, Serena, WTA. On paper, Konta seems to be the winner in this matchup, based on form and based on stats. If Jo and Serena are aware of this piece of info then it could actually reverse the pressure from Williams shoulders to Konta’s. I’m hoping that Serena goes into this one prepared, relaxed and patient. It wouldn’t surprise me in the slightest if Jo won in straight sets. But I’d be equally unsurprising if Serena puts in her best match of the tournament and wipes her off the court. Because if Serena is able to play her game, with big serves, big returns and deep angles in both corners, it’s going to be very tough for Konta to play her game. Yep agree on all counts, fascinated to see how this match-up unfolds. Same! I was tempted to stay up for it but I haven’t been well and need the sleep. I’m so impressed by Konta, and have been for the last six months or so. I have an interest in a way, being British. But she strikes me as the supreme athlete, great movement, fantastic physique and technique, determination and ever-growing confidence. I’m not a betting man, but I’m tempted to put something on her winning the tournament. Again, Konta has not been tested. So far, she has overpowered all her opponents. I want to see how she handle a power hitter like Serena. However, I do think that she is a dark horse. If she beats Serena, she will win the AO GS. I can’t say if Konta is playing good or bad. She hasn’t played a heavy hitter yet. I will judge her skills tomorrow. I think Konya doesn’t stand a chance! Serena will dis mantle her. Konta chokes. no surprise. What was that game 16? That’s a quitter mentality. How she choke? 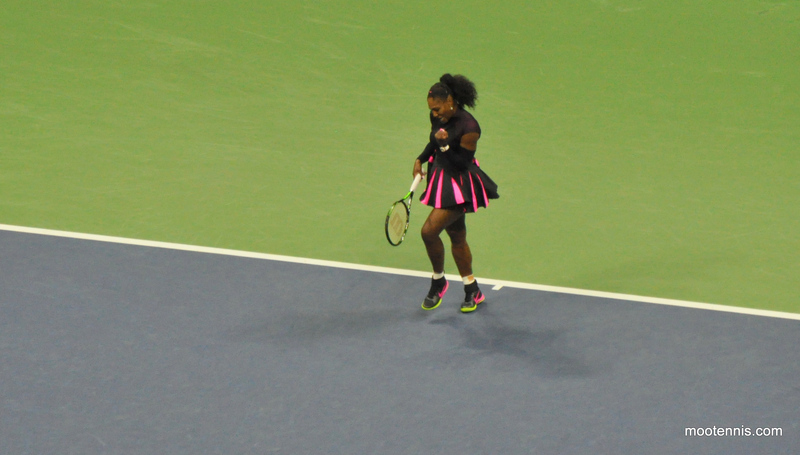 Serena raised her level and took advantage of her short balls. Konta had no other level to go and Serena’s ground strokes were on fire. It was a great match and Serena should of won it 6-1 6-2 to be honest. It is a bit of both. Serena upped the ante for this one as she should and Konta could not rise up to answer that call. Just playing Serena already does things to your nerves. Like I said, there was a certain amount of pressure for Konta to beat Serena. This wasn’t like Angie in last years final or Vinci in the US Open a couple years ago where it was expected for Serena to win outright, Konta really had a good chance of scoring the win here and that takes away some of the freedom that the other ladies have had against Serena when theres been an upset. this is why serena is the greatest women tennis player of all time, u can disagree all u want but the games speaks for themselves, she will be the player on tour till the day she retires…..who can boast of that in any sport. I feel like she’s close to her retirement now and she’s trying to put in one last period of dominance. yeah ur not wrong…. i think she wants to break the record and call it a day tbh.. she can do that this year then probably play one more year just for the fun of it and then leave…she aint showing any signs of ageing so she can still be at the top till she retires. I don’t think Konta loss was nerves because she played her same game, she played throughout the tournament. The difference is Serena prevented her from playing her game. Both players never played each other before and both were feeling each other out. Everyone initially anticipated that this match was going to be a three-setter. But, I knew it from the beginning that Serena was going to take down Konta in two sets. Why? Konta has played Venus before, in four current head-to-head meetings. So taking that rivalry into account, Venus was able to give some very good tips to Serena. Plus, coach Patrick Mouratoglou knew that Konta is a dangerous player. Anytime Serena plays against a tough opponent, she really elevates her game and that helps her beat her opponents in two sets. Unlike Kerber (who is EXTREMELY predictable now), Serena can be unpredictable in the sense that she can anticipate her opponent’s game better than anyone I’ve seen.